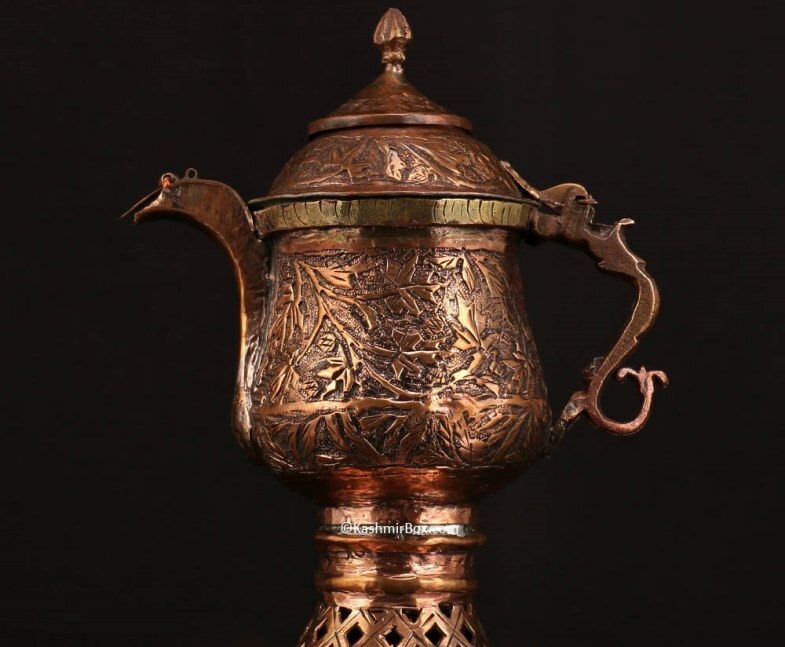 Samovars are typically crafted out of plain iron, copper, polished brass, bronze, silver, gold, tin, or nickel.In Kashmir Samovars are used for Noon Chai and Kehwa. There is no home in Kashmir that does not have a samovar. Each family has one or two samovars. Kashmiris make tea in the samovar. Kashmiris are very fond of tea. That is why any time is considered tea time. Inside a samovar there is a fire-container in which charcoal and live coals are placed. Around the fire-container there is a space for water to boil. Tea leaves, sugar, cardamom, and cinnamon are put in the water. Samovars are not of only one type. Some samovars, in which only one or two cups of tea can be made, are very small. Other samovars, in which hundreds of cups of tea can be made, are very big. Samovars are made of copper or brass. 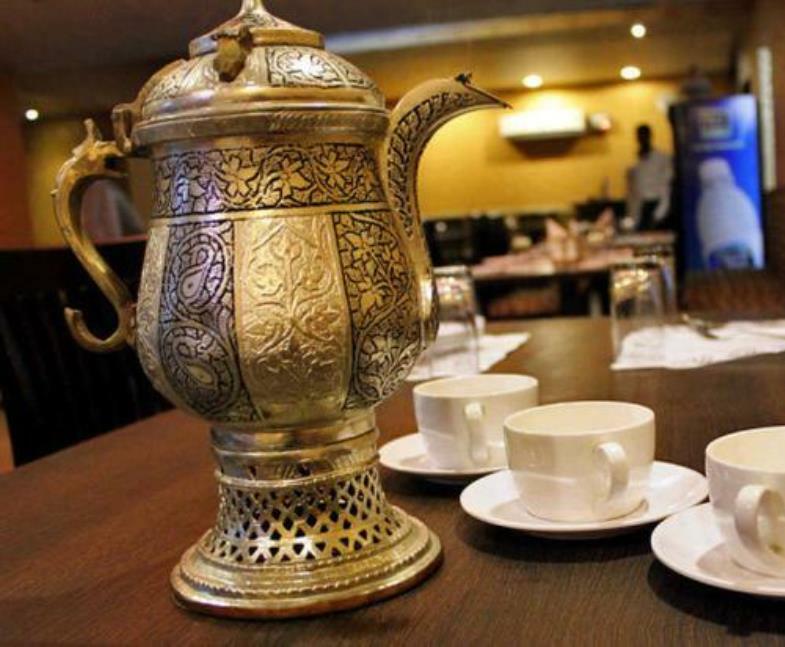 A samovar (Kashmiri: samavar) is a traditional Kashmiri kettle used to brew, boil and serve Kashmiri salted tea (Noon Chai) and kahwa. 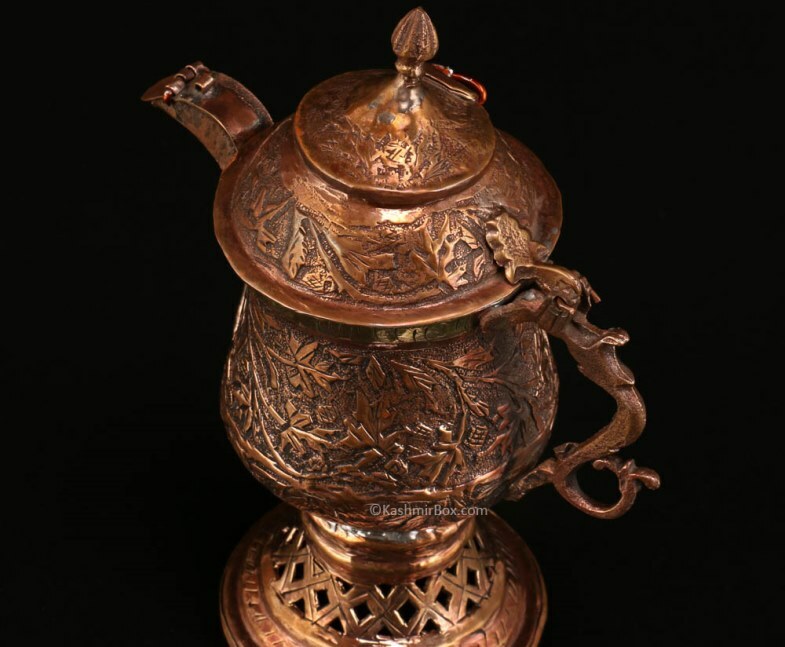 Kashmiri samovars are made of copper with engraved or embossed calligraphic motifs.In fact in Kashmir, there were two variants of Samovar.The copper Samovar was used by Muslims and that of Brass was used by local Hindus called Kashmiri Pandit.The brass Samovars were nickle plated inside. Inside a samovar there is a fire-container in which charcoal and live coals are placed. Around the fire-container there is a space for water to boil. Tea leaves, sugar, cardamom, and cinnamon are put into the water. Samovars are typically crafted out of plain iron, copper, polished brass, bronze, silver, gold, tin, or nickel. A typical samovar consists of a body, base and chimney, cover and steam vent, handles, faucet and key, crown and ring, chimney extension and cap, drip-bowl, and teapot. The body shape can be an urn, krater, barrel, cylinder, or sphere. Sizes and designs vary, from large, "40-pail" ones holding 400 litres (110 US gal) to those of a modest 1 litre (0.26 US gal) size. A traditional samovar consists of a large metal container with a faucet near the bottom and a metal pipe running vertically through the middle. The pipe is filled with solid fuel which is ignited to heat the water in the surrounding container. A small (6 to 8 inches) smoke-stack is put on the top to ensure draft. After the water boils and the fire is extinguished, the smoke-stack can be removed and a teapot placed on top to be heated by the rising hot air. The teapot is used to brew a strong concentrate of tea known as ??????? (zavarka). The tea is served by diluting this concentrate with ??????? (kipyatok) (boiled water) from the main container, usually at a water:tea ratio of 10:1, although tastes vary.